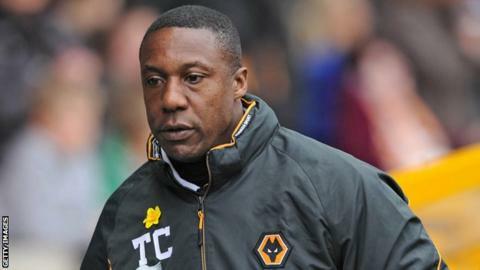 Wolverhampton Wanderers have sacked assistant manager Terry Connor. Connor, who had a four-month spell as interim boss last season following Mick McCarthy's dismissal, leaves Wolves after 13 years at Molineux. Stale Solbakken was named the club's permanent manager this summer after Connor was unable to save Wolves from relegation from the Premier League. A Wolves statement said: "Terry leaves Wolves with the very best wishes and thanks of everyone at the club." Connor, who joined the club's coaching staff in 1999 under then-boss Colin Lee, became assistant manager to McCarthy in 2008. Following McCarthy's departure in February, Connor was given the managerial position until the end of the season, after Walter Smith, Alan Curbishley and Brian McDermott all ruled themselves out of contention for the job. During Connor's tenure as manager, Wolves failed to win any of their final 13 games of the season, gaining only four points from an available 39 and finishing bottom of the Premier League. Connor, 49, reverted to his assistant manager role when Norwegian Solbakken was named as McCarthy's permanent successor in June. However, Wolves have only picked up four points from their first four league games of this season.